In this post, you will find the best free file transfer software for PC-AOMEI Backupper Standard to copy/sync files or folders to the location wherever you want in your Windows 7/8/10. With the development of digital life, file transfer also named file copy or file sync plays an important role in our daily life. As we know file transfer implies the transmission of a computer file through a communication channel from one computer system to another. If you plan to share your files or folders to your friends or families, you can transfer these files to their computers, or you can upload these files to cloud, and your friends can access the cloud to view these documents. Of course, you can copy your data to external hard drive to share your information. Generally, transferring file manually is a complex and tedious thing, it will spend you a lot of time and energy. When Will You Need to Transfer Your Files? 1. Buy a new computer. You have some important documents in your old computer and want to edit these files on the new PC. 2. Migrate OS to SSD or HDD. It’s necessary to migrate Windows operating system (OS) from your original HDD to a new SSD/HDD to gain a better performance. 3. Share your data to others. Where there is information, there is a data interaction. It’s everywhere. What to do when there is a plenty of stuff to transfer in your Windows PC? Is there a file transfer software for PC to realize transfer multiple files at once? Unlike other file transfer software, AOMEI Backupper Standard is a free yet professional file transfer software for Windows users, which allows you to sync files to local hard drive, external HDD, SSD, NAS device, even the cloud drives, like Google Drive, OneDrive, Dropbox, Box, Sugarsync, Cloudme, etc. In addition, it is capable of doing real time sync, file or folder backup and restore, and other backup solutions. How to Transfer File in Windows 7/8/10 Safely? Free download file transfer software for PC to PC-AOMEI Backupper Standard, run the program after the installation. Select Backup tab in the home interface, and choose File Sync. To differ from other backup tasks, input a proper Task Name. Press Add Folder at the Step1 to choose which files will be transferred. Select the cloud drive as the destination to save these files or folders at the Step2. Tips: You can also transfer files to local hard drive, SSD, external HDD, etc. according to your needs. 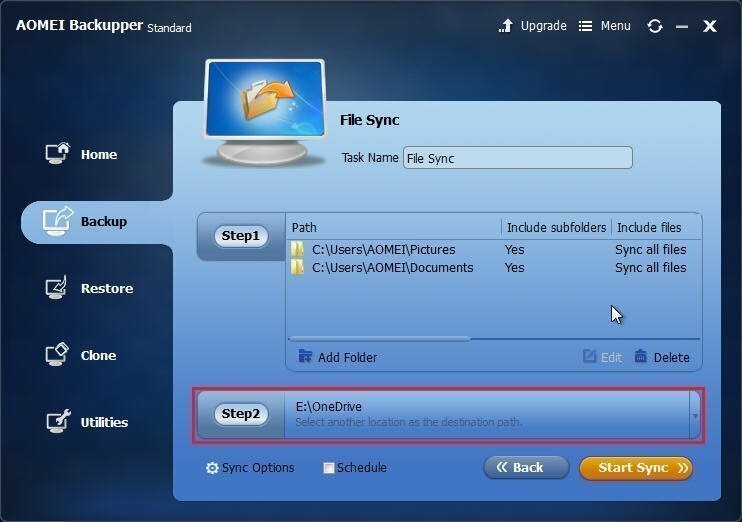 Click Start Sync to transfer files with the best file transfer software for PC. After a while, these files will be transferred to cloud with a success. The free file transfer software for PC also allows you to migrate OS to SSD or HDD, transfer entire hard disk data to another one, etc. 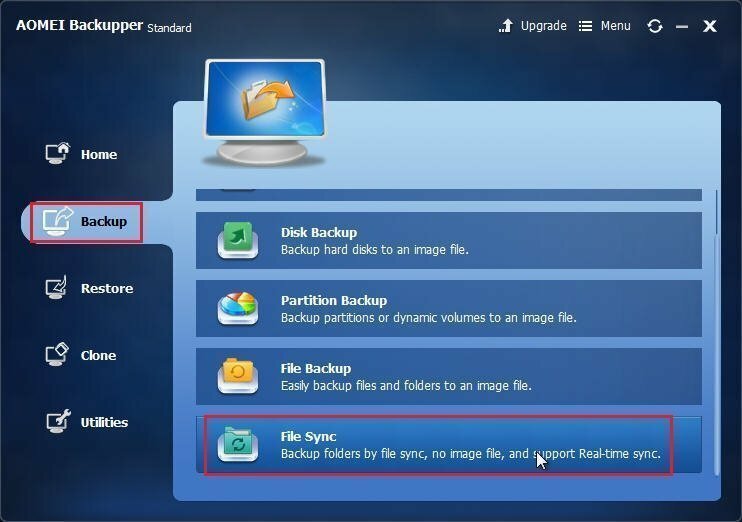 Obviously, you can also backup your data and restore your data to dissimilar hardware computer to transfer files with AOMEI Backupper Professional.